Choose Edit | Preferences and click the Text tab to open this panel. These settings control when objects are labeled, and whether or not the Text Palette appears automatically. Show Labels Automatically: Check For all new points to show the labels of new points when they’re created. Check As objects are measured to show labels when you measure an object. As you make a measurement, the labels needed to name the measurement will also appear. For example, if you measure the length of a segment between two unlabeled points, the segment endpoints’ labels will also appear. Even if you don’t show labels automatically, you can show (or hide) individual objects’ labels by using the Text tool or choosing Display | Show Labels. 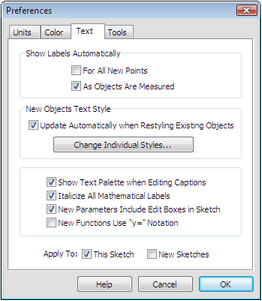 New Objects Text Style: Sketchpad maintains separate default text styles for newly created labels, captions, values, action buttons, tables, and axis tick numbers. Check Update automatically when restyling existing objects to automatically update one of these default styles when you change the style of an object. For instance, if automatic updating is checked and you change an action button's style to be Arial 14-point italic, the next action button you create will also be shown in Arial 14-point italic. Uncheck this box, or press Shift when applying a style, to prevent automatic updating. Click Change Individual Styles to open the Text Styles dialog box and change the default text styles for the various categories of text. Show Text Palette when editing captions: Check this box to make the Text Palette appear automatically whenever you edit a caption and disappear when you finish editing. You can also display and hide the Text Palette by using the Show Text Palette command. Italicize all mathematical labels: Check this box to use automatic italics for most object labels, including geometric objects, measurements, parameters, and user-defined function names. Calculations and function definitions appear using mathematical italics in a way that is consistent with the most common standards for mathematical typesetting. Uncheck this box to turn off automatic italics. New parameters include edit boxes in sketch: Check this box so that the values of newly created parameters are displayed with an edit box, and can be directly edited in the sketch. New functions use "y=" notation: Check this box to display newly created functions in "y=" form rather than "f(x)=" form. To change the notation of an existing function, double-click it to edit it; in the Calculator choose the notation you want from the Equation pop-up menu.